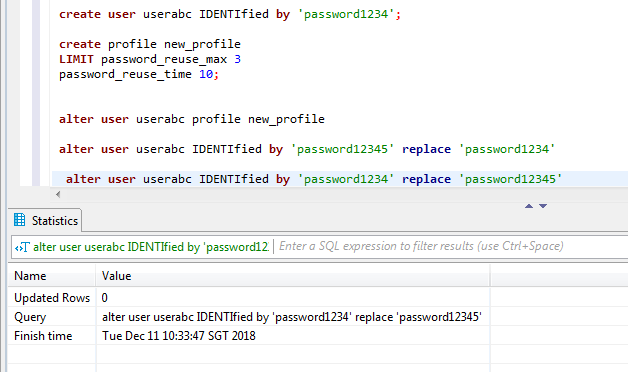 How come password_reuse_max is not enforced? 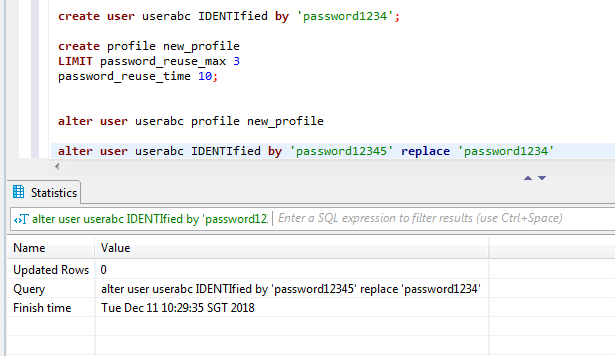 when I change the password to "password12345" and change the password again back to "password1234", I'm excepting the password change to be rejected since PASSWORD_REUSE_MAX is set to 3. I shouldn't be able to use back the old password. Did I miss out some setting? Thanks a lot for your help vertica community. Did you assign the profile to the user? What SQL tool are you using? I tried the script in VSQL first where it worked, then I tried DbVisualizer which uses JDBC. Works fine there too (see attachment). Although, I am using Vertica 9.2 and matching JDBC driver. I did a cursory search for bugs in Vertica 8 for what you are seeing but could not find anything obvious. Are you using a password security algorithm other than MD5?